Build relationships and increase trust by providing Jive’s turnkey cloud PBX/UC system to your clients. 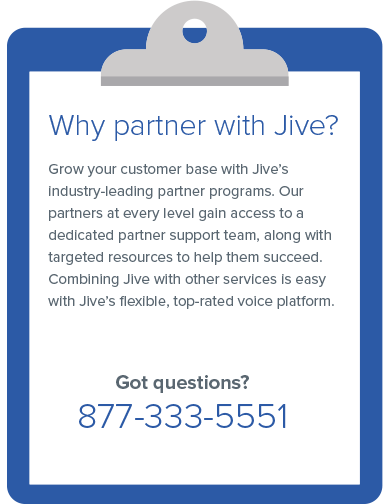 Jive provides industry training, sales support, sales engineering assistance and handles the back-office work of system-setup, porting, billing, technical support, and customer service while keeping you involved at every turn. Jive partners with the industry’s leading Master Agents. If you currently work with one of our Master Agents, you can begin offering our full suite of products and services today. Earn leading upfront and evergreen residuals. 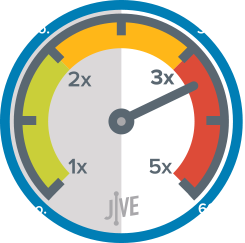 Leverage Jive’s extensive sales support resources. Receive industry training, tools and marketing support. Team with local/regionally based Channel Managers. Enjoy quota-free contracts that reward production. Conditions apply. Ask your Jive representative for full details.